The Group firmly believes that an effective environmental, social and governance system will help achieving sustainable development and sharing value of sustainability in the economic, environmental and social dimensions with its stakeholders. The Group has integrated its objective of sustainable development into daily operation, through by enhancing resource efficiency, reducing pollutant emission and resources consumption and strengthening safe production measures as its fundamental operational policies. Going beyond the pursuit of economic benefits, the Group has also proactively participated in charitable activities to make contribution to the society, devoting itself in promoting the local economic development and building a harmonious relationship with community. Production safety is the first priority of the Group. In line with the belief of "Safety is the Best Blessing for Employees and the Greatest Efficiency for the Enterprise", the Group implemented the production safety responsibility system and enhanced the production safety standards. By strengthening the construction of "Five Teams", which covers safety supervision, gas, water detection and drainage, electrical and mechanical and transportation, and reinforcing the safety training for all staffs, the Group has standardised and systematised the safety management and laid a solid foundation for safety production. In accordance with the "Production Safety Law of the People's Republic of China" (《中華人民共和國安全生產法》) and the "Safety Regulations in Coal Mine" (《煤礦安全規程》), the Group has firmly performed its responsibility to maintain safety in the coal mines by strictly executing operational rules of safety and the relevant systems and regulations, carrying out tracings and inspections, conducting stringent evaluation and implementing strict but fair reward and punishment scheme. Pursuant to the rules in respect of prevention of occupational diseases under the "Safety Regulations in Coal Mine", the Group has set up a function especially responsible for the prevention and management of occupational disease in coal mines. With appropriate facilities and measures, the employees have been well protected from occupational diseases. The prevention and control of occupational diseases have been safeguarded by mass surveillance. Environment protection is an important issue in the Group's operation policies. An "Environmental Management System" has been established by the Group to define the responsibilities of organisations and employees in all levels in respect of coal mine resources, pollutants and use of resources and to serve as guidelines for planning, prevention, governance and statistical analysis of environmental protection activities. Meanwhile, online monitoring systems has been installed over the emission ports as required by the environmental protection department of the PRC for real-time supervision of the execution of environmental protection policies by the Group. In the operation of business, a range of pollutants are inevitably generated by the Group. As a responsible corporation, the Group strives to mitigate the environment pollution from its operation to the greatest extent through the implementation of pollution controls. 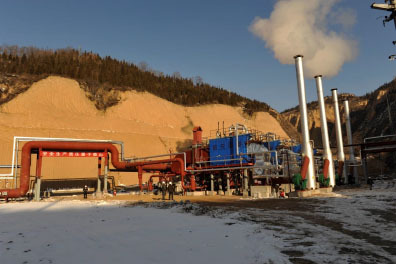 The Group's atmospheric pollutants are mainly generated from its boiler system. The Group has fully carried out flue-gas desulfurisation, control of soot emissions and boiler modification to reduce atmospheric pollutant emissions. The water pollution is caused by mine water and domestic sewage. The Group has established mine water and domestic sewage treatment systems to prevent direct discharge of untreated sewage. The Group's solid waste is mainly the mine tailings generated from underground mining. The solid waste which cannot be reused is stored at the designated site for pile up of the mine tailings. The Group will carry out land reclamation and greening work when appropriate so as to improve the ecological environment. The Group mainly uses power resources and water resources during the course of business in order to achieve its operational objectives. As a responsible corporation, the Group optimises the use of resources through energy saving and consumption minimisation. The Group has enhanced the power consumption of equipment through better organisation and arrangement, reasonable deployment, strengthening the repair, maintenance and modification of the electrical and mechanical equipment. At the same time, the consumption of electricity resources is further reduced by adjusting the sequence of operating procedures of transportation equipment at the mining site, removing the lighting of the unmanned underground area and reasonably shifting electricity use to off-peak hours and preventing the lighting of the ground office from constantly powered on. The Group carries out mine water and domestic sewage treatment through the mine water and domestic sewage treatment stations and reuse the treated waste water to remove soot in underground mines, clean the equipment and perform environment greening work as well as other purposes. The Group attaches great emphasis on the people-oriented principle in respect of employee responsibility and is determined to protect the legal rights and interests of employees. The Group also cares about the physical and mental health of employees and proactively supports talent's growth so as to facilitate the long-term development of employees and enterprises.